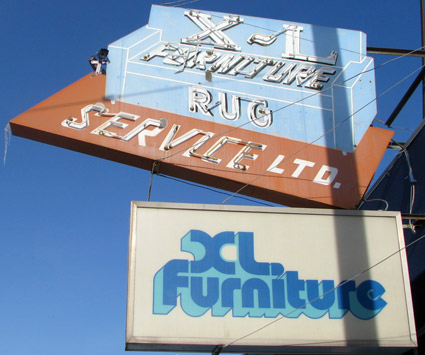 The iconic neon X-L Furniture sign was installed in 1961. Rented from Blanchett Neon, for a monthly agreement of $32, this sign was repaired and repainted numerous times over the next 50-plus years. In the early 1970s, the owner redesigned the logo, which was hung underneath the original neon sign, because complete replacement of the neon sign would have required (by City regulation) that the new sign be flush against the building, rather than projecting perpendicular. Al Struzynski, the current owner, stated, "If it were not for that City regulation, the neon sign would not have survived to this day." Edward 'Ed' Struzynski incorporated X-L Furniture, a carpet and furniture cleaning business in 1952 hoping to capitalize on the return of prosperity following World War II. He believed people would have the means to spend a little more of their income on home furnishings and upkeep. After a successful start, Ed moved his business in 1955 to a better location (11349 - 95 Street) in Norwood. X-L Furniture settled in easily with the neighbourhood. However, in 1960, the single floor building with a wood floor burnt down. The Struzynski family rebuilt a new two storey store (still present today as the centre bay of the store) the next year, and soon expanded their business to include furniture reupholstering, carpet and drapery sales and installations. The store was again expanded in 1972, when the north bay was built, doubling the size of the building, allowing for more furniture showroom space.